Nikola Tesla (1856-1943): prolific inventor, developed alternating current (AC), was hugely famous in his lifetime, but died impoverished and in debt and mostly forgotten. 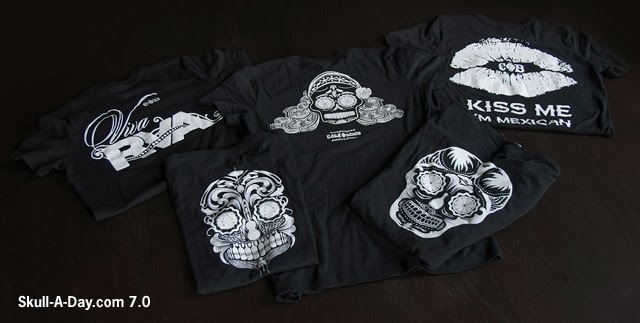 Skull Appreciation Shirts On Sale! 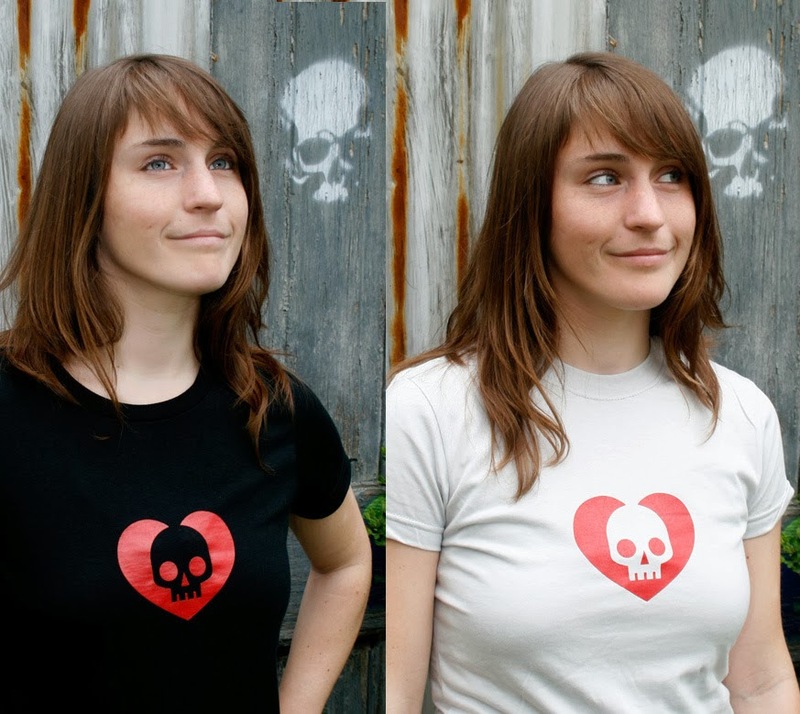 In the spirit of this spooky season we've put the last of our Skull Appreciation shirts on sale! The remaining men's and women's shirts in both black and silver on soft eco-friendly fabrics are just a mere lucky $13 until they're all gone! Once they run out we won't be reprinting so don't miss out on this last chance to show your skull love to the world on your chest. Get them HERE. Don't forget to make a reservation for some time to sign up for our latest giveaway. 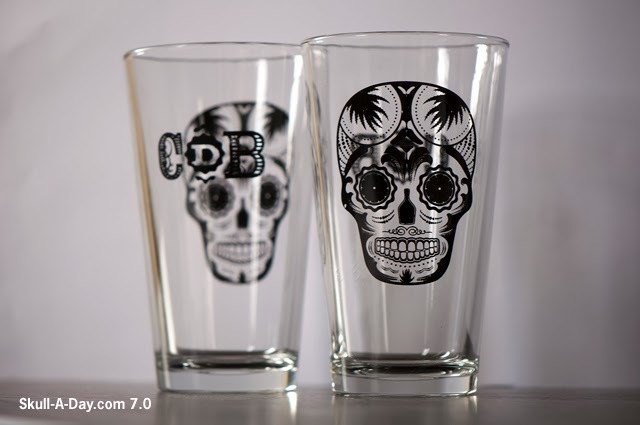 You only have until 11:59:59 PM Eastern Time, Friday Nov. 1st to get entered to win one of 4 FREE sugar skull items from Casa Del Barco Restaurant in Richmond, VA. 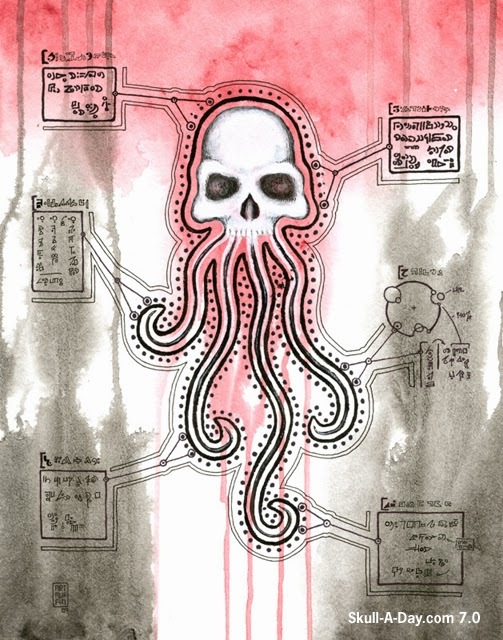 Returning contributor, Brent Griffith, is back today with something completely different from his pen and marker drawings that we featured before. This time he's armed with "only my phone, my fingers and various apps". I especially like the "kaleidoscope" looking backgrounds. 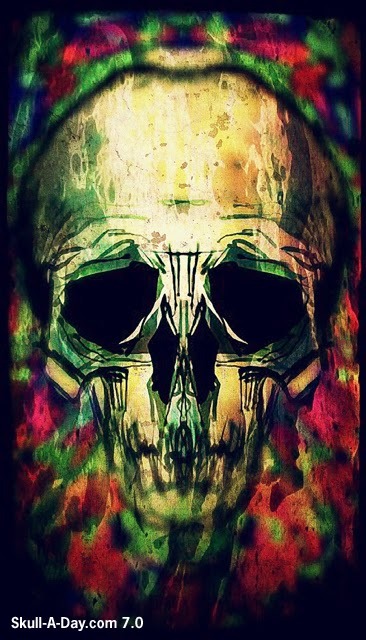 A bit of colorful fun for such a creepy cranium. Thanks again for sharing your work with us, Brent! 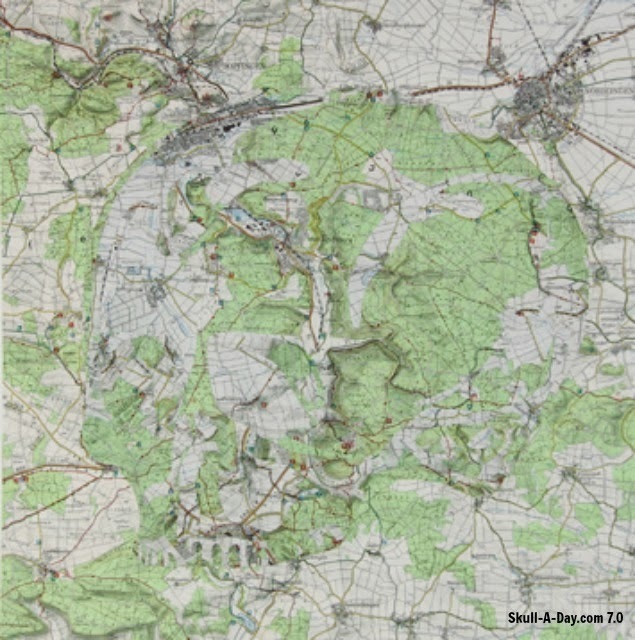 The other participating artists include Linda Ayala, Marsha Gray Carrington, Sean Carroll, Hector Castellanos-Lara, Daniel Corrigan, R!ch Cihlar, John Gulyas & Maryann Posch, Joshua Haplea, Nina Vivian Huryn, Salavador Jimenez, George Kocar, Craig Matis, Amanda Plavan, Dante Rodriguez, Andrew Shannon and Gary Spinosa. 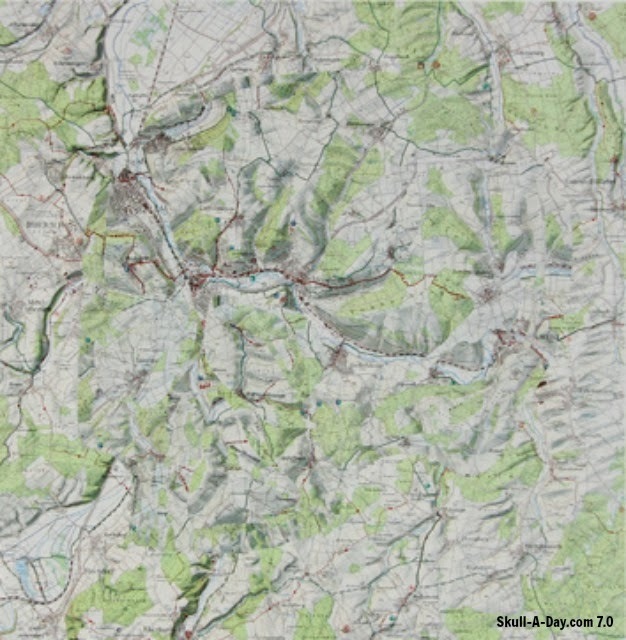 If you're in the area you can find out more about the exhibition HERE. "Using recipes passed down from his Hispanic grandmother, Executive Chef Todd Richardson aims to bring a new twist on traditional Mexican dishes to Richmond. Unique entrées such as Beef Barbacoa Enchiladas, Gaucho Cut Skirt Steak, and Blackstrap Molasses-Glazed Salmon will delight visitors as they dine in the historic circa 1890s Reynolds Metals Italianate building, featuring recycled and repurposed materials throughout, from the tabletops to the bar’s foot rail. Casa Del Barco boasts a growing list of over 100 different tequilas, sure to please the casual spirit drinker to the seasoned aficionado." 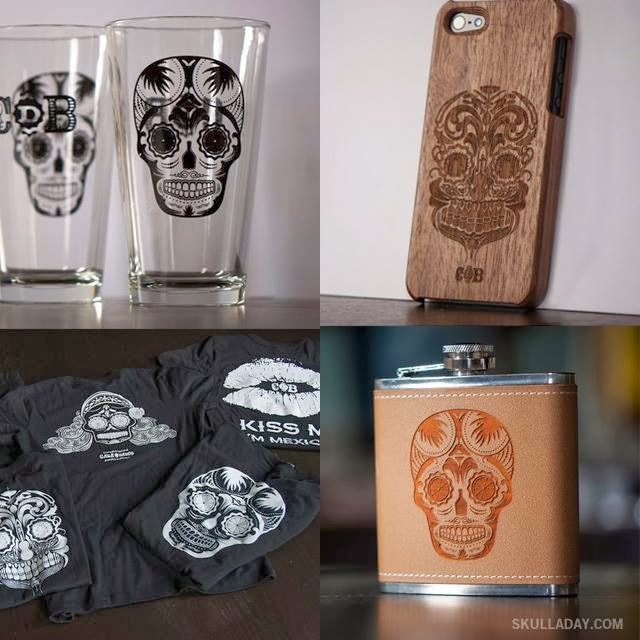 PRIZE INFO: Four lucky winners will receive one of the following prizes: 1- CDB skull flask, 1- CDB skull bamboo iPhone cover (Sizes: 4s, 5, 5s or 5c),1- CDB skull t-shirt (mens and/or womens), 1- set of 4 CDB sugar skull pint glasses. One prize per winner. 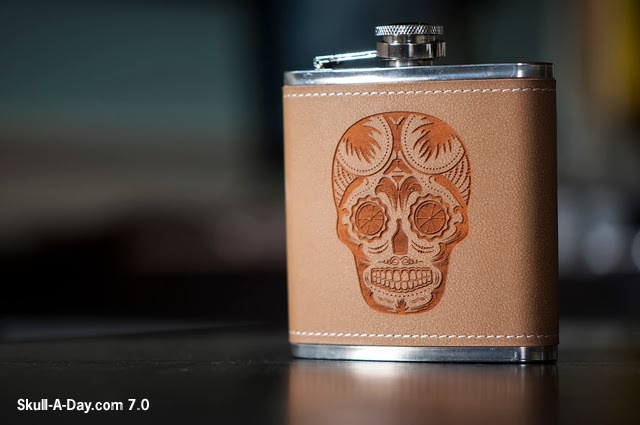 HOW TO ENTER(this is important): Leave a comment stating your opinion on whether you think it's "tequila" or "ta-kill-ya". No offense to you tequila connoisseurs, but I say it's the latter(I'm a scotch and whiskey kind of guy). I also know - to each their own and I want to know where you stand. 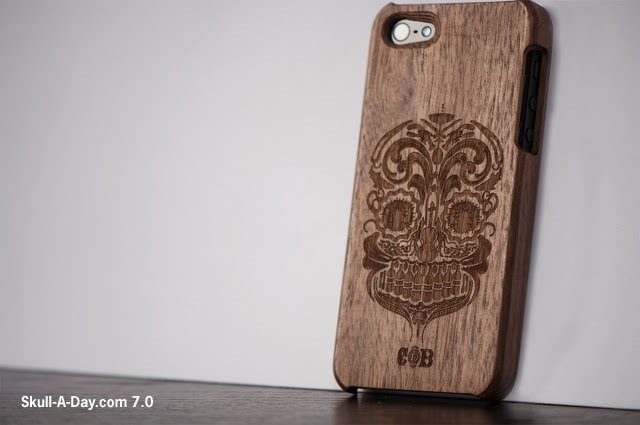 p.s.- Since the iPhone case is such a specific prize, and not everyone may need that, please also include "iPhone- yes" or "iPhone-no" in your comment. That way we will know and send it to an appropriate winner. Thanks! CONTACT INFO: If you win, we need to contact you. With your comment you must include your email address. Entries are only valid with this information! You can break it up to avoid spammers(i.e. 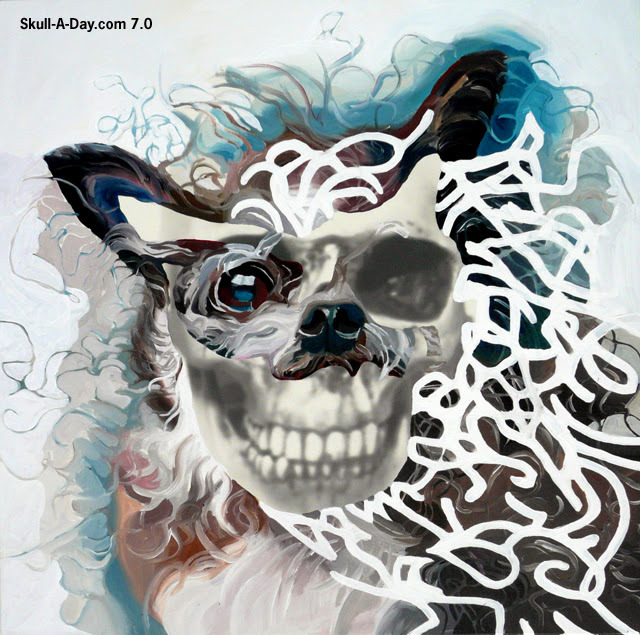 skulladayfan AT skulladay dot com). CONTEST CLOSES: 11:59:59 PM Eastern Time Friday, November 1st. PRIZE SHIPS: To skull lovers across N. America. Sorry to those overseas. IF YOU DON'T WIN: You can visit Case Del Barco yourself if you are in the Richmond, VA area. Check out their site to find out more on where to find them and about what's happening at Richmond’s premiere dining destination for upscale Mexican cuisine, waterfront dining and a one-of-a-kind tequila bar. Thanks to Casa Del Barco for these awesome giveaways and The Flores Shop for designing them! 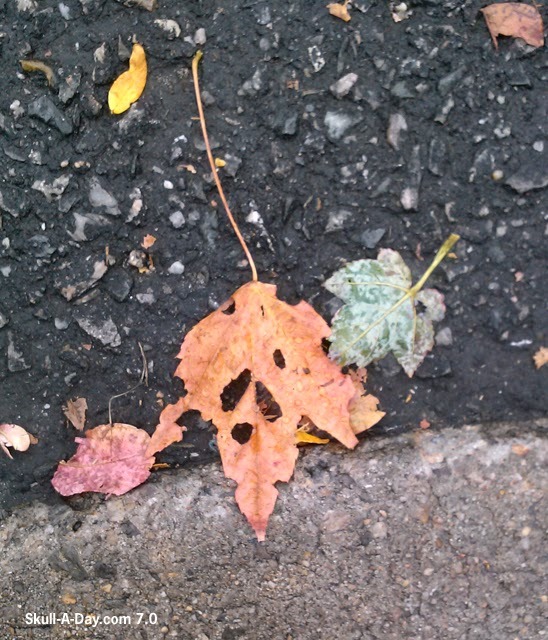 Today's simulacrum come from separate locations, but I'd swear they were separated at birth. Emily from Philadelphia, PA found the first long lost twin, and our own skull master, Noah, found the second in Richmond, VA. It's hard enough to find these sneaky skulls, but to see the striking resemblances between these two leads me to believe that they MUST be from the same family. I'm sure a dendrologist could help me out, if I only knew one. Thanks for sharing your finds with us, Emily and Noah! 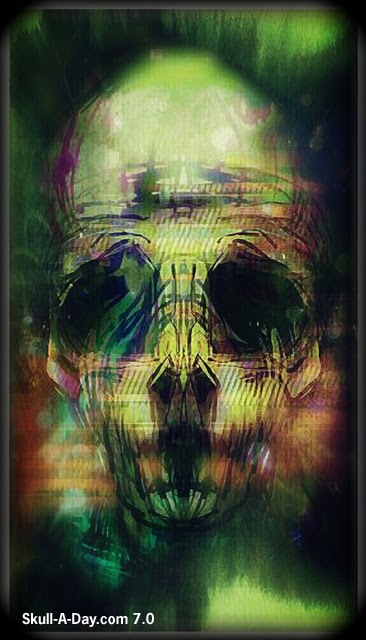 Of course you can say that pretty much ALL of the artwork we share on Skull-A-Day is Halloween related, but I had a really serious feeling of this with the first piece here from Karen Dittman. 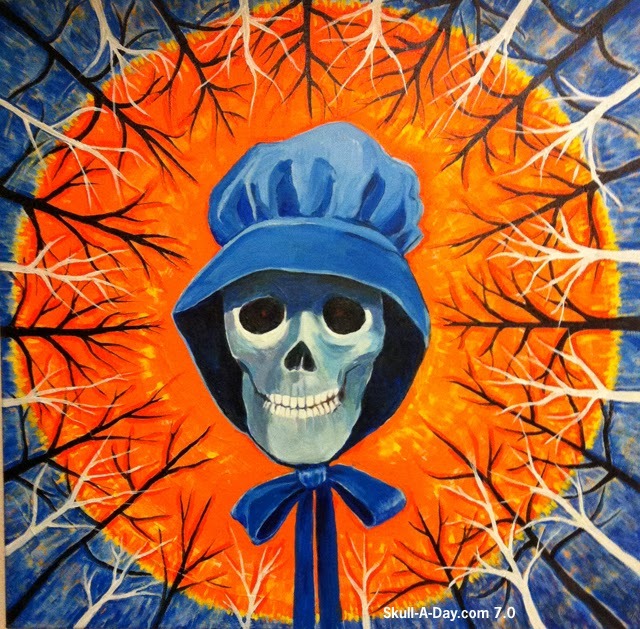 "Blue Bonnet" has that eerie, deep in the woods, crazy lady gonna getcha vibe that you can only get with a great scary story around a campfire in the fall. Thanks for creeping me out, Karen(in a good way!). Paula Osbun, of The Grinning Skull, created these clay skulls. These necklaces are her signature style and available for sale on her website. With Dia de los Muertos in a few days, these cheerful skulls would be a perfect addition to any calavera costume. However, if you are like me, they are great any time of the year. Charles Darwin (1809- 1882): developed the theory of evolution known as natural selection, which he based in part on observations of birds in the Galápagos. The theory was nearly universally accepted by scientists by the time he died, but has been consistently reputed by religious fundamentalists ever since. 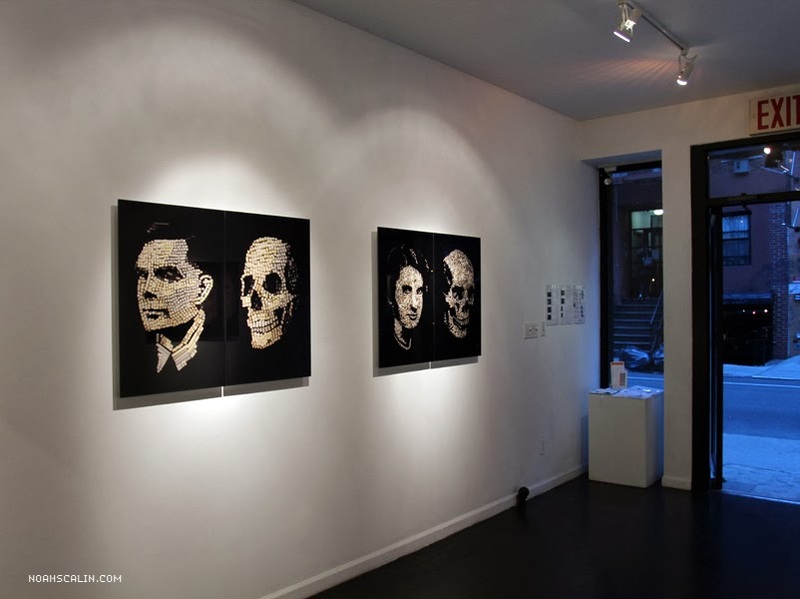 Here are a few shots from my exhibition Natural Selection, currently on display at Krause Gallery in NYC running now through November 24. If you're in the area please stop by and check it out! Details are HERE. 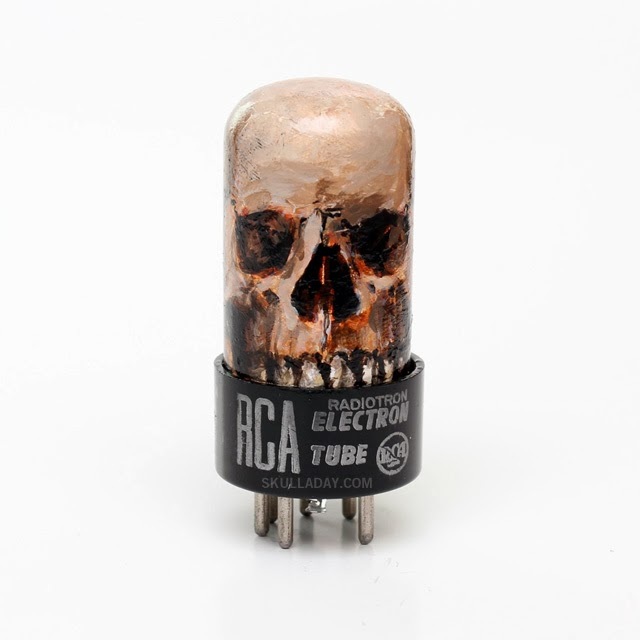 I created a new Skeletube for the Think Small exhibition opening this week at Artspace in Richmond, VA. The show requires all work to be 3" x 3" (x3") or smaller and this hand-painted vacuum definitely fits that requirement. 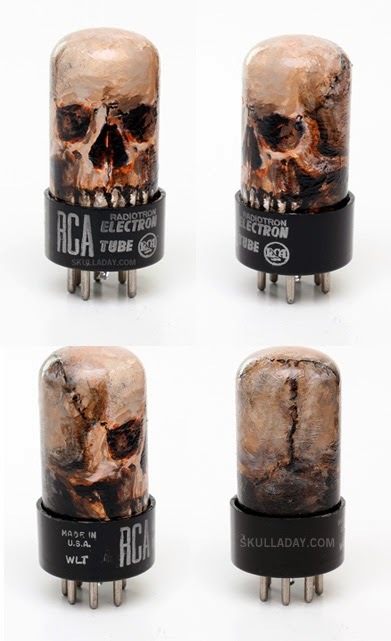 See my previous Skeletube creations HERE and hey, if you want to own one, check out the Skeletube Store! 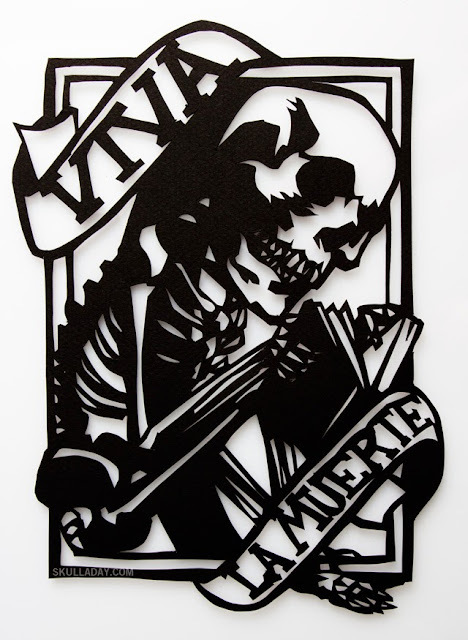 Skeleton Cardboard painted these skeletons on old prints that he found discarded on the curb and destined for the garbage. Skeleton Cardboard is in London and has been painting skeletons on anything they can find (mainly cardboard) for about a year now. Street art is becoming a more respected artform, and one I admire. 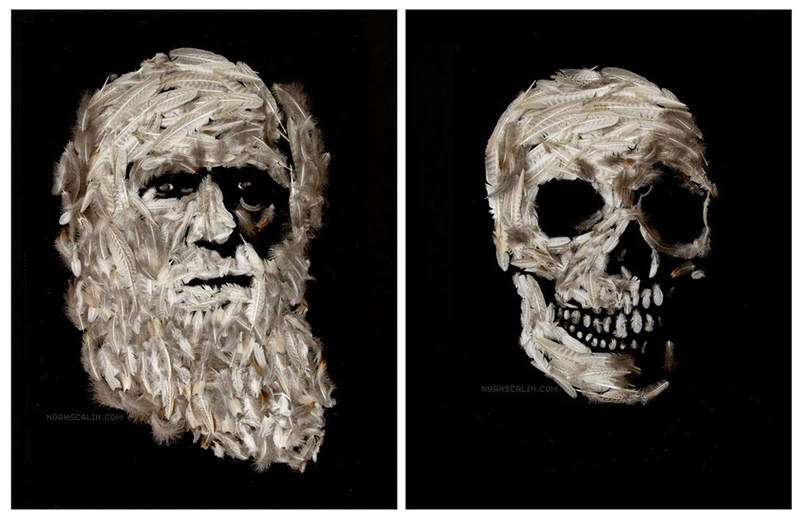 For this artwork below, I like that the artist is reusing old found artwork and adding their own skeletons to it. There are a few artists that do similar things with monsters, but I hadn't seen someone do this with skeletons, so of course I'm intrigued. You can find more of their artwork on Facebook and Instagram. I don't want to say that today's simulacra are s#!++y, but that would be a technically accurate statement. The first of these excellent excrement captures is from Carolyn Tuttle in Richmond, VA and the second is a night shot from Tim McGinnis in Willoughby, OH. I apologize for the language(I WAS a sailor once), but like my Dad the umpire always taught me, "You gotta call'em like you see'em." Thanks for sharing these, Carolyn and Tim! Tony Yarbray has a peculiar way of fulfilling a request with this skull stencil. 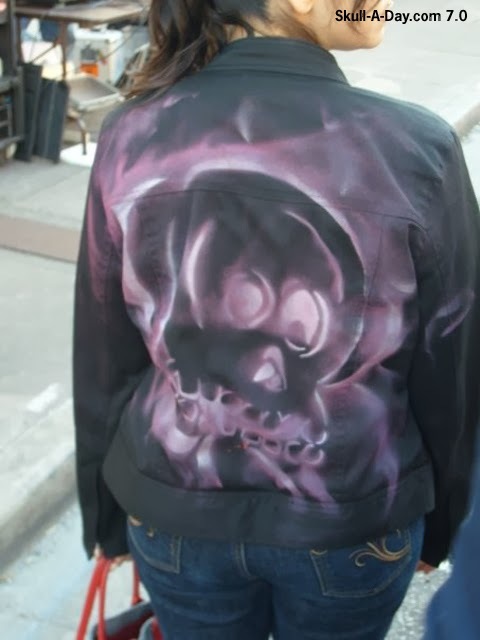 He tells us, "This young lady asked me to ruin her jacket for her a couple of years back so I started to cut the sleeves off it for her, but then she told me she just wanted me to spray the skull stencil I had made on it. 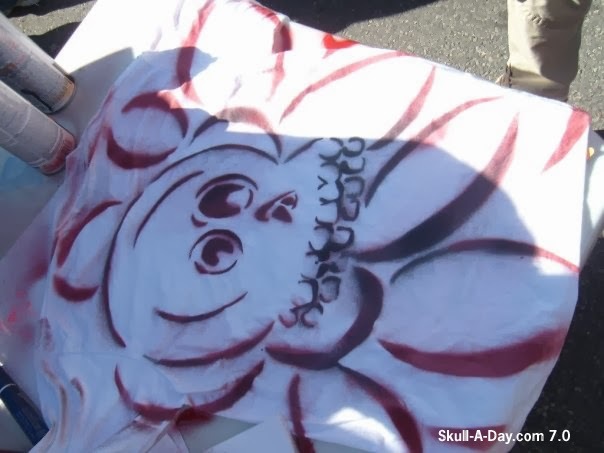 When some kids saw her do that they all wanted a skull on their shirts. I hope their parents didn't whoop them." I hope so too, Tony, but I'm sure everyone was okay in the end with their new additions of skullrific decorations. Thanks for sharing it with us, and not getting us whooped! 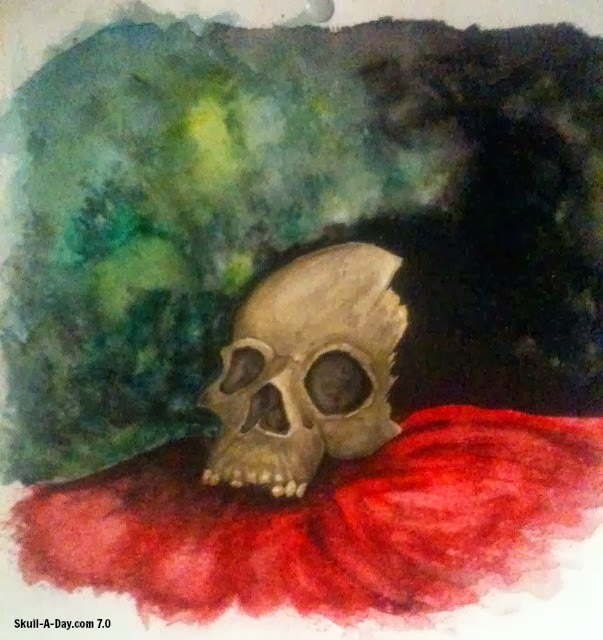 Dirk Wild of Pennsylvania created this watercolor skull. Watercolor has become one of my favorite mediums to work with. It's great to build and reduce color intensity, and manipulate the shapes and blending. It had a mix of softness and strength that can help create beautiful paintings like this one. 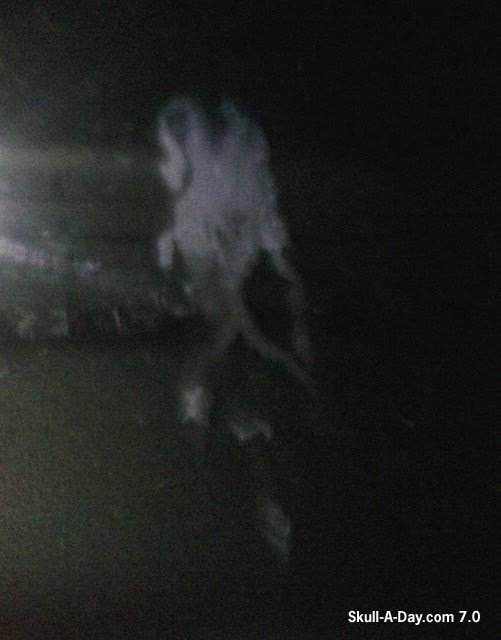 With the blurred background, it looks as if the skull is sitting on a blanket in the clearing of a dark forest. 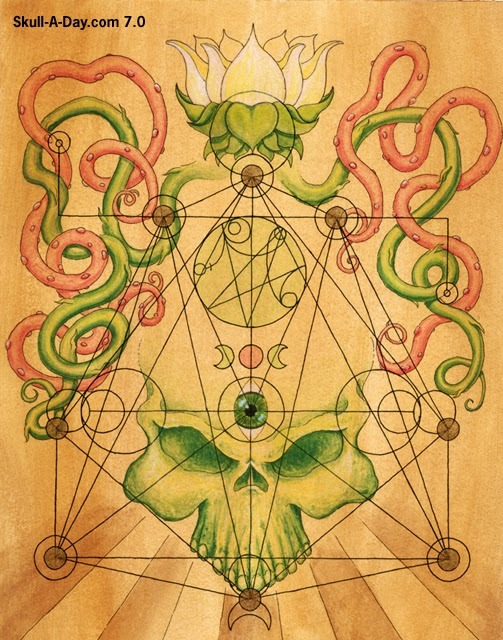 Perhaps it's being discovered, or buried...only the artist truly knows. [BONUS] 412. 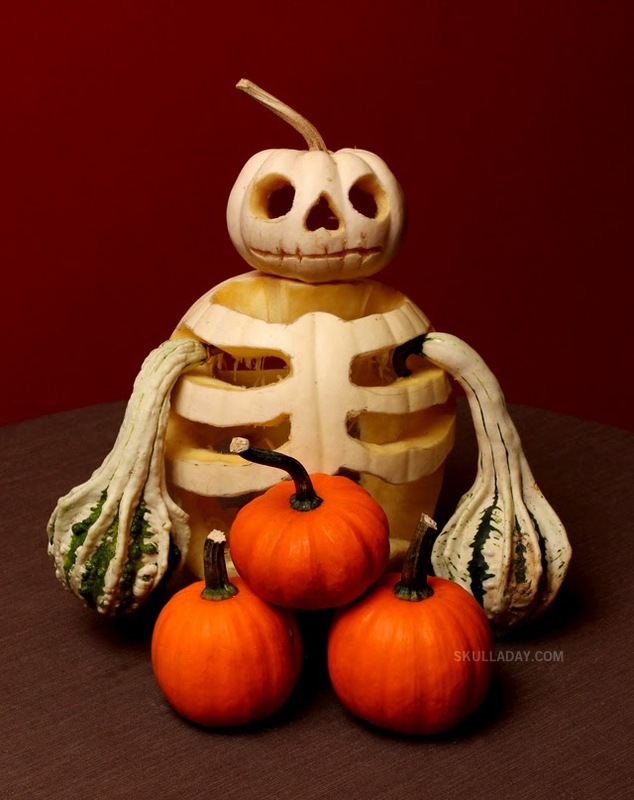 Pumpkin Anatomy III: It's the Great Pumpkin! After carving a pumpkin with a skull and a pumpkin with a brain previously, I decided I really wanted to carve a skeleton pumpkin this year. I knew I would make the rib cage and head out of two separate white pumpkins, but wasn't sure if how to accomplish the arms. At first I was going to just leave them off. But when I was sorting through the haul from my family's recent visit to the pumpkin patch I discovered that I had two funky gourds that fit this bill perfectly, and required no carving! How's that for some creative serendipity? You can also see my original Skull-A-Day project pumpkin carving HERE. Have you made your own skull/skeleton pumpkin carving, or heck, if you give this design a try this year, send us a pick to share! 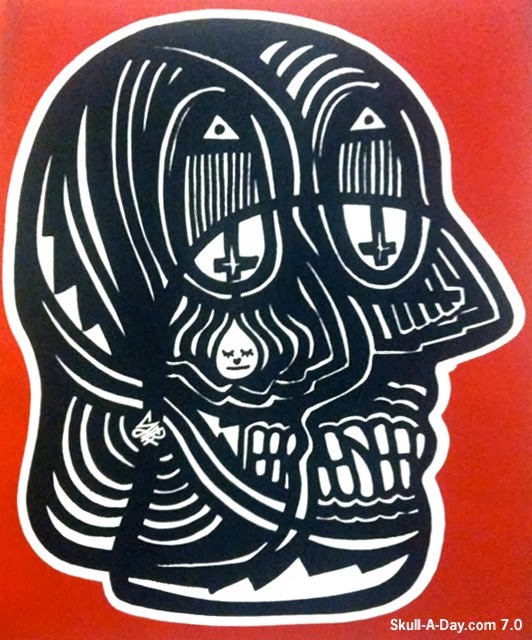 Septerhed is the alias of today's artist. This piece titled "Blooddemon" has me recalling creepy medieval times of haunting demons and the foreboding art of their beware. I think I need to go repent or something now. 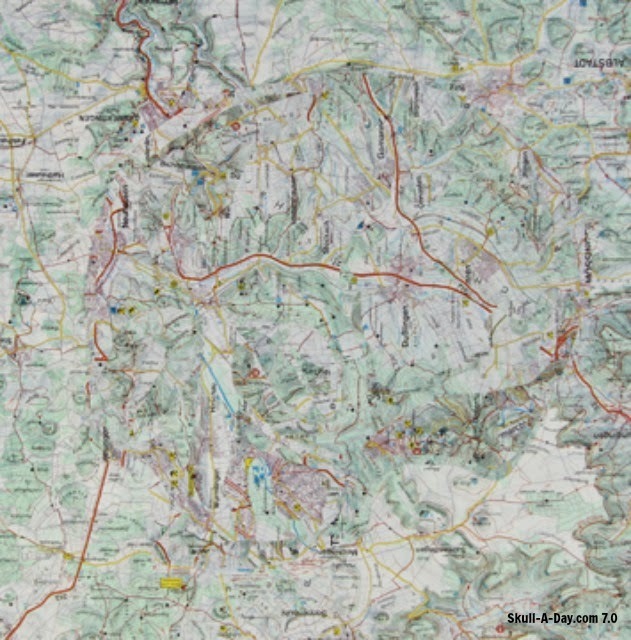 Thanks for sharing this, Septerhed! 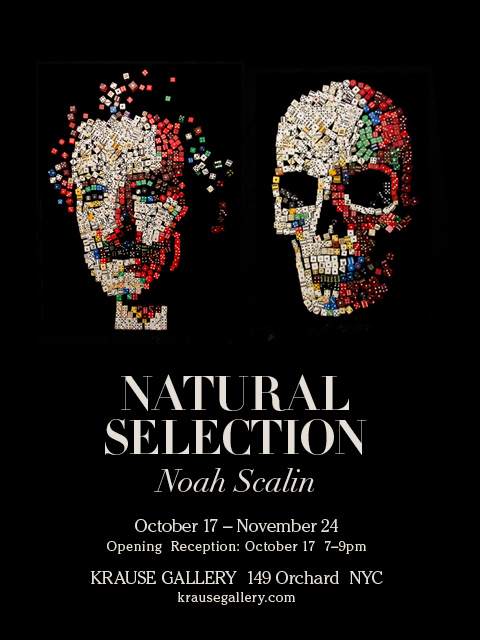 Natural Selection, my exhibition of portraits of scientists and their skulls opens tomorrow in NYC. If you're in the area I hope you'll check it out! 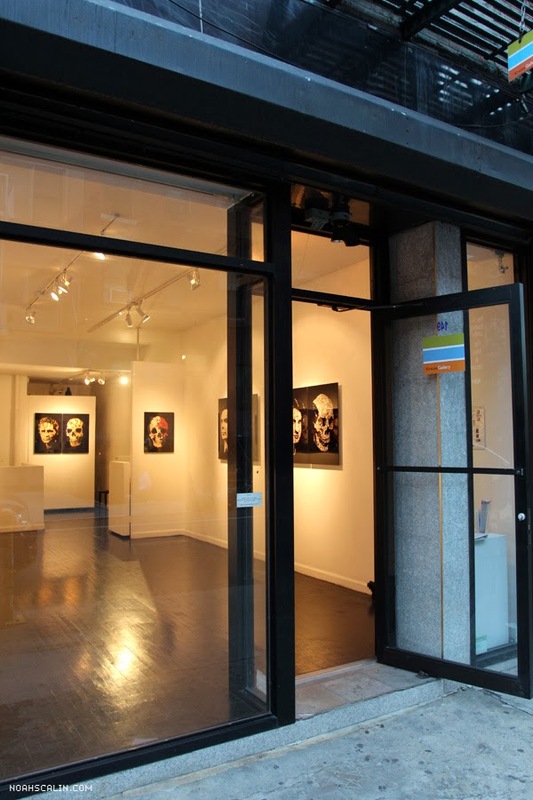 The show runs through November 24 at Krause Gallery in the Lower East Side. RSVP for the opening reception HERE. 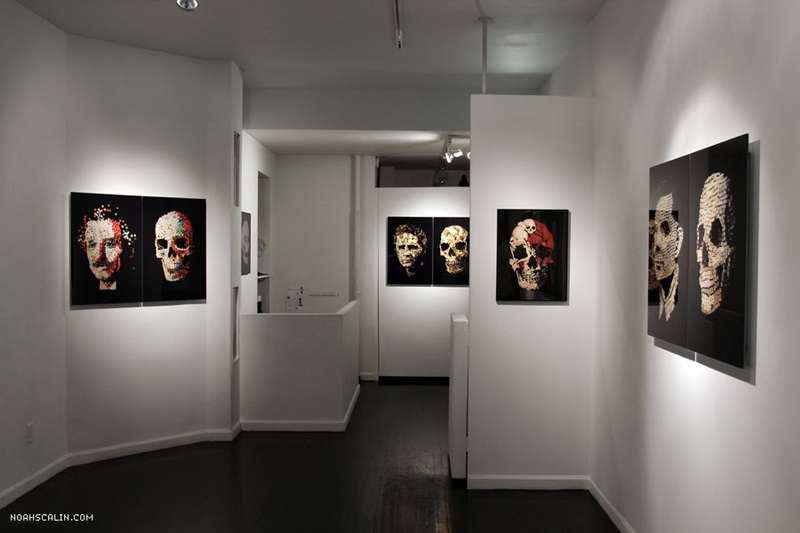 Karen Kuttner is an Austrian painter of skulls who works with mixed media also. This piece is her favorite one titled "Der Dackel Waldi ist auch tot". She adds, "I hope you like my little dead dog!" Of course we would rather have a little live dog, but the way she has resurrected this dog and skull show is quite impressive. 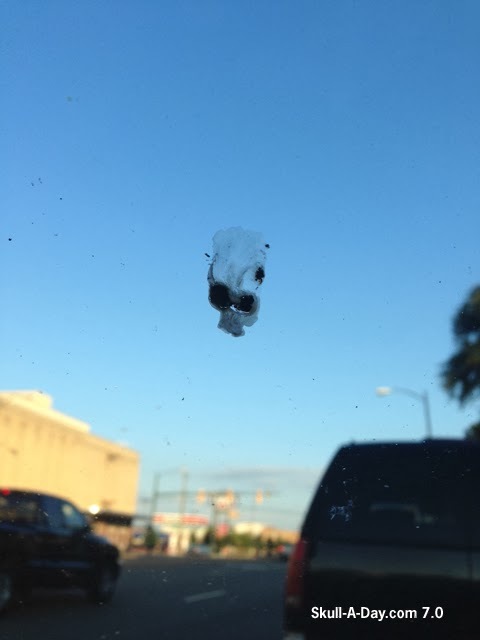 Thanks for sharing it, Karen! 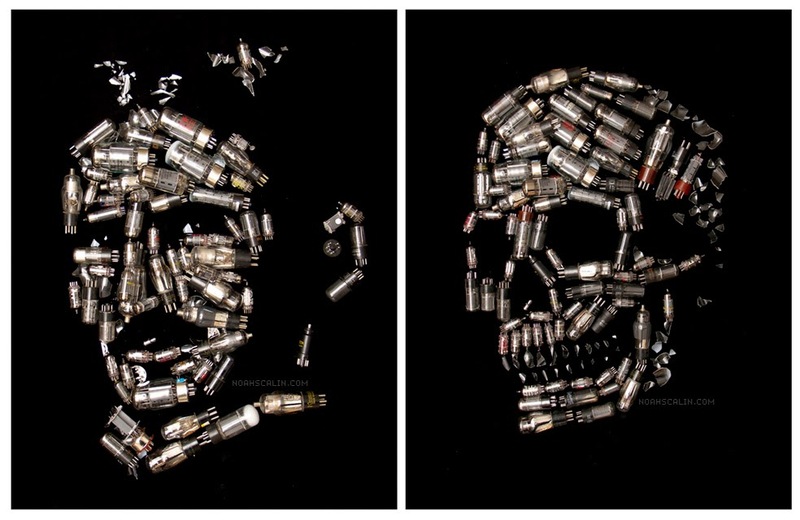 Mike Diana created this demon skull. With Halloween a few weeks away, this creation seems appropriate. The origins of Halloween in it's current form, are mixed. 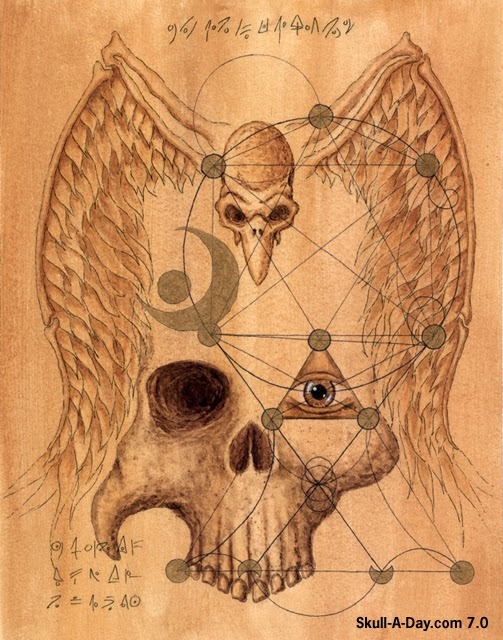 Demons imagery is commonly used during Halloween, and are found in many Halloween histories. As the summer season has slipped on by for most of us, we welcome in fall and the festivities it brings. Luckily, grilling outdoors is a past time that extends to both seasons, and drinking beer is well, a year round activity. 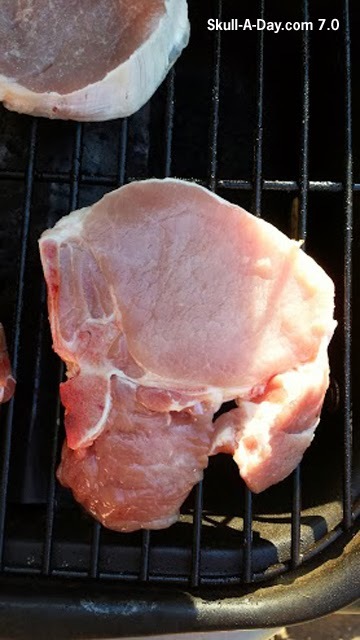 So this Sunday I would like to thank Carol Ann Dreistadt who noticed this skull in her Heineken in Woodbridge VA, and Rachel Bender for the delicious looking pork chop skull. I hope that all of you have a fall filled with similar results. Enjoy! Sometimes the hardest part of being a Skull-A-Day editor is trying to decide which piece(s) of art to display from the submissions we get. Espcecially when any one artist decides to submit a whole handful of wonderful work. So, sometimes you just gotta say F*@k it and do what feels best(which is a pretty zen thing to do actually, thank you Sarah!) and post all of them. Today is an excellent case in point from ARTmuffin. These pieces are just a small assortment of what lies ahead for you to discover on his site. 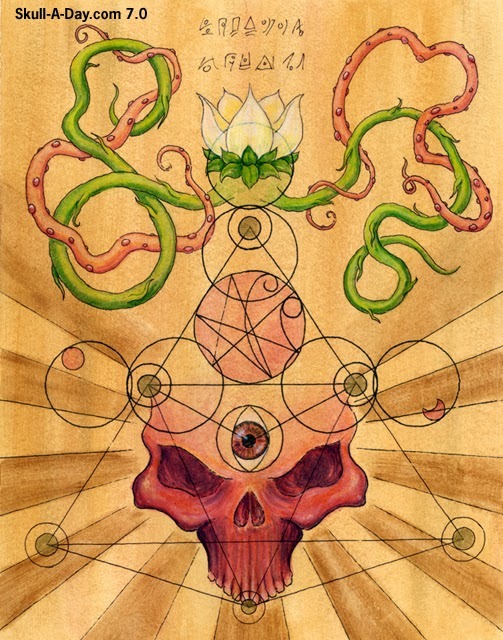 I'll let him tell you a little more, "My art is created with the concept of being pages from a lost book or temple from another culture in another dimension. 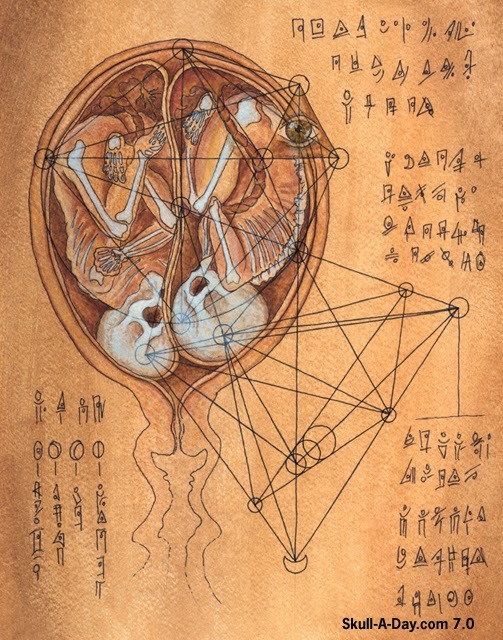 The work is often human, alien, or animal anatomy with what appears to be a kind of hieroglyphic writing and symbolism accompanying the subject. The pages vary from anatomical description to ceremonial preparation to the preservation of a history. All pages are from 'The Book of Gosh'." ARTmuffin hits it dead on the head for me. 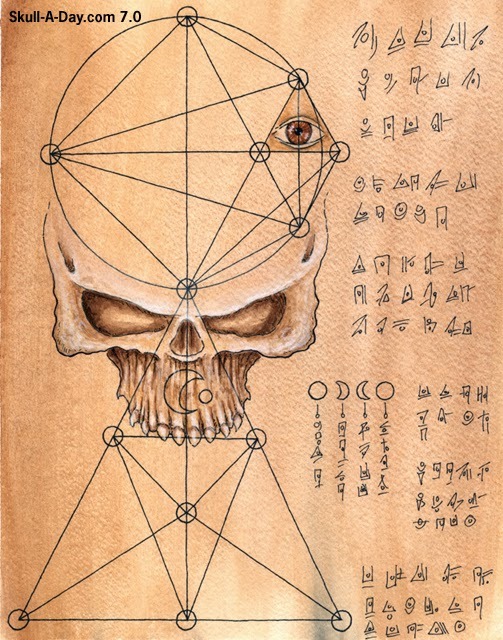 I love skulls, Geometry, ancient history, and mystery. He's got all of that going here as well as a myriad of other skullacious works that could fill a month's worth of posts for us. It's a great collection of awesome work. Plus, ARTmuffin is doing more awesome work by donating a portion of any of his sales to the charity of your choice. He's letting your love of art go directly to helping others. 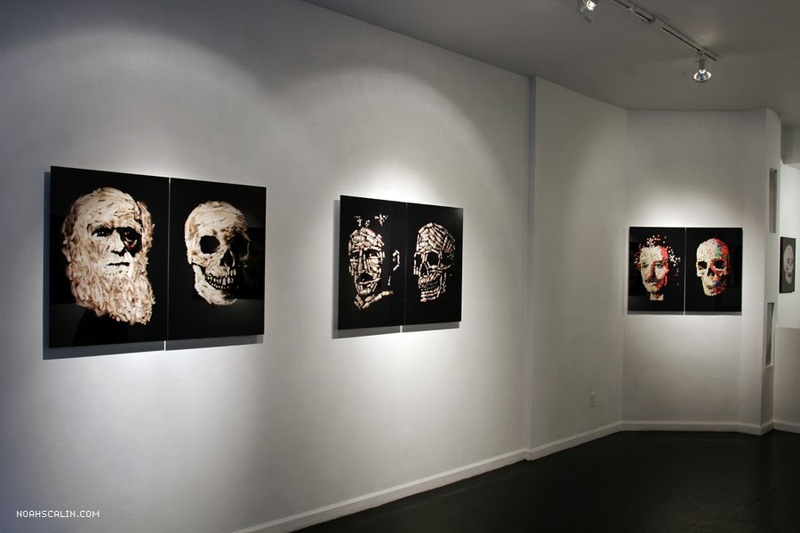 There's no better way to serve humanity while indulging into some fantastic skull art. Thanks for sharing all of these, ARTmuffin! 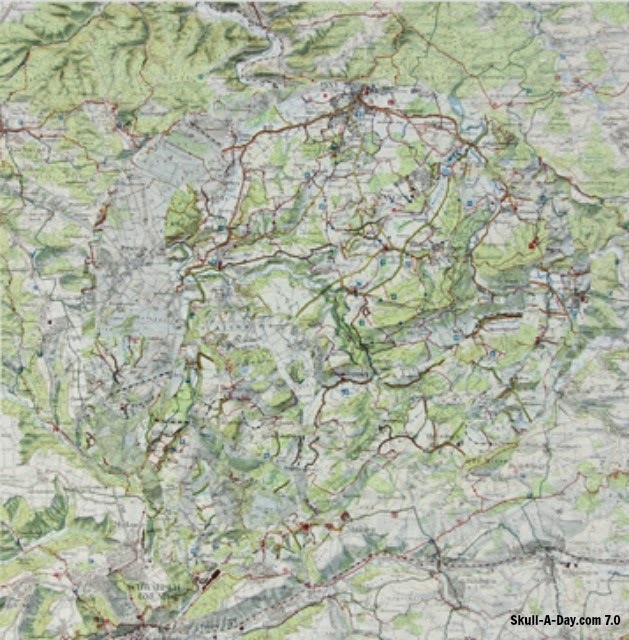 Eike explains, "These are collage made of old hiking maps (37 x 37) on bristol pasteboard 50 x 50." This is an interesting reuse of materials. Reminds me of Noah's Skull Island. 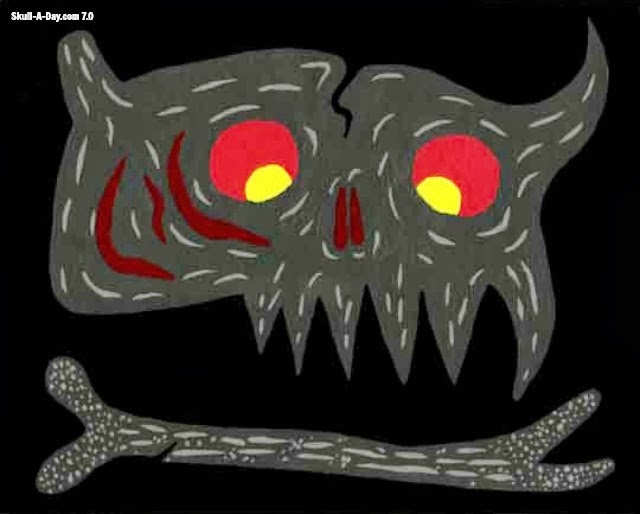 I wonder how these locations would look in person, if they were actually rearranged into a skull. 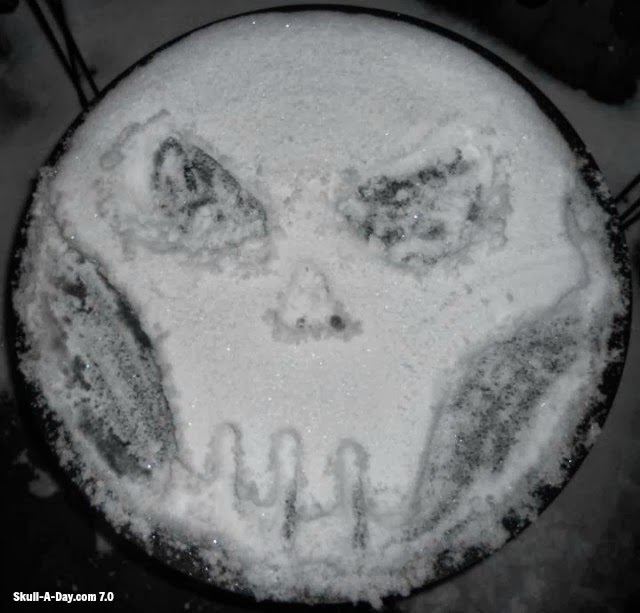 Coen Velden, from Geldern, Germany, created this snow skull on their garden table, spontaneously last Winter. With the weather cooling down here, snow is on it's way. We don't get much here in Richmond, VA, but Tatman gets feet for months in Michigan. Normally our amount is only enough to make a thin skull like Coen's or this Snow Skull Noah made in NYC However, there is the rare season every few years where creations like Noah and Paul's Snow Skull is possible. I'm hoping for a Winter like that...granted that I've stocked up with hot coco and popcorn before it arrives.